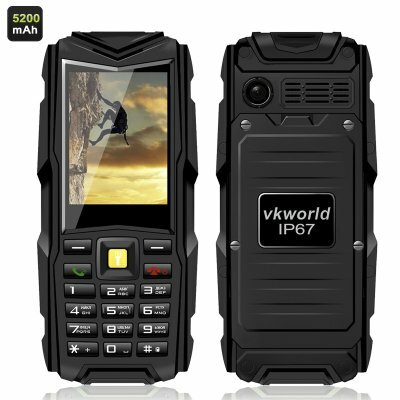 Successfully Added VKworld Stone V3 GSM Phone - 2.4 Inch Display, 5200mAh Battery, Power Bank, Bluetooth, IP67 Waterproof Rating (Black) to your Shopping Cart. The VKworld Stone V3 is simplicity at its best. Reliable, compact, easy-to-use and with great battery life, it’s a perfect phone for those spend who love an active lifestyle or work a tough job that requires rugged accessories. This small rugged smartphone will give you everything you need in a simple compact form and waterproof shell. The phone comes with IP67 rating: it’s totally protected against dust and can be immersed in water for up to 1 meter. With a small 2.4 inch screen, you will have all the needed information conveniently displayed without making the phone vulnerable to drops and scratches. It comes with 2 SIM cards and will ensure great connectivity. With Bluetooth you will also have easy pairing with other devices: speakers, computers, other phones and more. The bar phone comes with a huge 5200mAh battery and can double as a power bank for other devices. With a 1.2MP camera, you will also be able to take quick snapshots of the surroundings and store your pics right on the phone or on an 8GB micro SD-card. You will also be able to listen to the phone’s built-in FM radio. Good strong telephone. Simple to use. Exteme battery time, good flashlight. Great receipt, good sound quality.